The New Year can help motivate us to follow better habits that will make us healthier and happier. One of the most common realistic resolutions that people have is to take better care of their oral health, so here are 10 Oral New Year’s resolutions to commit to. You’d be surprised at how many people simply don’t brush correctly. The internet is a fantastic resource to learn how to properly brush your teeth to ensure a perfect clean all around. Or, even better, talk to your dentist who will be able to give personalised advice based on any conditions you may have. It is vital to remove old particles of food that get stuck between your teeth and to clean around a tooth in areas that your toothbrush normally can’t get to. This can be a little tricky, especially in those hard-to-reach areas, but you can get a variety of gadgets such as interdental brushes that are much easier to use. Your dentist is just as important as any other health professional you see, so make sure you visit them more often to get your teeth checked. Here at The Mead Dental Practice, we advise all our patients to visit us at least twice a year, both for a routine examination and hygienist appointments. Come and experience our all-new advanced AIRFLOW technology treatment which gives the ultimate clean. Find out more about it by reading our blog by 8-year-old Joshua: My AIRFLOW Experience. Healthy foods are vital for good oral care. You want to avoid sugary foods as well as trying to drink less coffee and tea, due to the additional staining that it can cause on the surface of your teeth. You also want to avoid eating too many acidic foods because they can damage the enamel coating on your teeth. Drinking more water means that you’re less likely to drink fizzy drinks, coffee and other liquids that could stain or damage your teeth. Water also helps to improve your mood, keep you hydrated and keep your mouth clean, so it is a win-win all around. Bad habits like smoking, biting your nails or even eating too many snacks can put your oral health in a bad position. So, make sure you’re always looking for ways to break out of those habits and your teeth will thank you for it. Make it a goal to ensure that you brush your teeth at least twice every day. Once in the morning and once at night is preferred, but if you already do this then why not go the extra mile and brush after meals as well? Far too many people just buy simple cheap toothpaste and brushes and expect them to work. Instead, make a resolution to invest more into your healthcare by looking at different brushes, pastes and products that could improve your oral healthcare. Here at The Mead Dental Practice, we recommend that our patients invest in a good electric toothbrush, compared to a manual brush. Not only does an electric brush offer better cleaning, but they can also help protect against issues like receding gums, due to them being gentler on your mouth. Smiling forces you to show off your teeth so you’ll be more inclined to take better care of them. Smiling makes you more approachable, it’s friendly and you can be proud to show off the teeth that you’ve worked so hard on to improve. Lastly, spread the word a bit and encourage family members to also care more about their oral health. If your entire family chips in to help, then you can all benefit from better oral health. If you are local to us in the Plymouth area and have not been to a dentist in a while, why don’t you get in touch and sign up with us for a new patient examination? 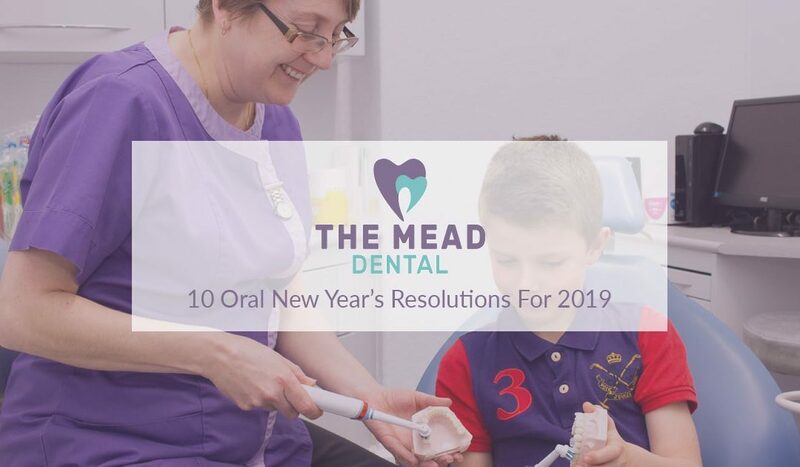 What an ideal way to start off 2019 and we can give you all the help and guidance to ensure you get the most out of your oral healthcare this year.